← Kinder Morgan: when will the falling knife land? October was a very positive month for equity returns. I’ve just updated my portfolio returns page, and my invested portfolio rose in value by 4.0%. This doesn’t recover the losses of the last two months, but it certainly retrieves some of the portfolio’s poise: my 12 month return stands at +6.7%. The coloured grid below shows the relative performance by sector for each of the last few months. You can see the equity markets are pretty correlated, but highly volatile; by contrast Fixed Income (and cash, obviously) are much more steady-as-she-goes. The standout figures last month were equity returns in the USA and Europe, each up around 10%. By contrast the UK and Australia were up about 4% each. 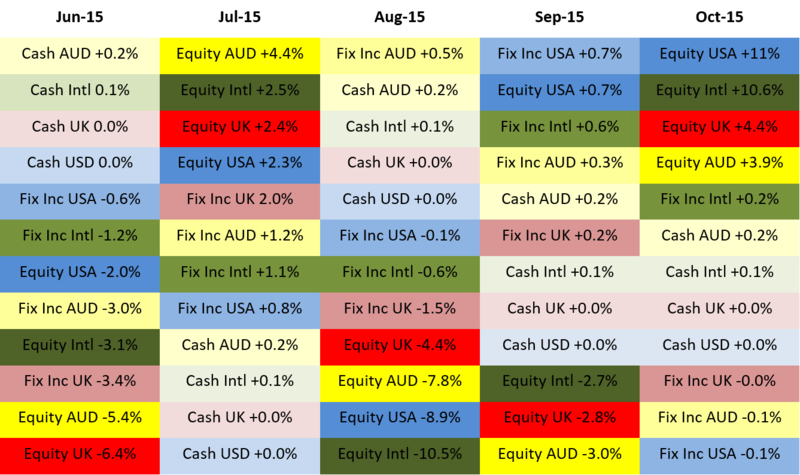 August saw similar moves, but down not up; September saw most markets continue to fall while the USA stabilised; the USA now tops the tree. Overall the market weighted by my exposure rose about 5.6%, which I lagged – disappointingly. My overall performance masks a number of sudden movements within my portfolio. Google, Amazon, McDonalds and N Brown Group all had excellent months. Pearson had a terrible month. That’s equity investing for you. I took the opportunity to close out my BWNG position and rebalance a bit out of UK Equities, which I am overweight in. I am not fully invested right now; I’m keeping some cash close at hand in case the market dips back down again. Good idea to keep some cash handy. I’ve got a wish list of stocks as long as my arm… Waiting for the right prices i.e. Cheaper than what they are at present! What is the composition of your portfolio in terms of percentages? any logic of holding foreign currency in your portfolio considering low interest rates? You are right that holding cash/currency, in current low interest rate, has almost no logic to it. My target allocation of these is very low, and my actual allocation is even lower. Arguably I shouldn’t even show them in the investment returns grid, but they serve as a quite a nice ‘baseline’ (i.e. small positive return).